Quentin Tarantino returns with another homage to a genre he loves, the Western. But as you may expect, it is produced his way. With a Blaxploitation slant, the hero of the tale is Django (Foxx), a slave liberated by a German bounty hunter who employs him to assist with bringing in a range of outlaws, dead or alive. 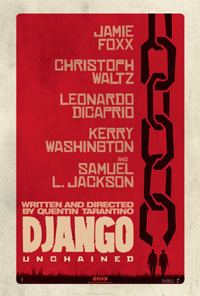 But, the main aim for Django is to find his wife (Washington), who was sold separately from him as punishment. The quirky German character (Waltz from Tarantino's Inglourious Basterds), is countered by the serious, headstrong Django, and their journey leads them to a plantation where all hell is set to break loose. Owned by an arrogant racist (DiCaprio) who treats his slaves like mere property (or animals), his house is run by an elderly black man (Tarantino vet Jackson), kowtowing to the master. The subject of slavery will probably always remain a sore point, especially in the USA. Never one to flinch at controversy, as with his vivid exposition of crime themes or WWII evil, Tarantino tackles the slavery preiod head-on, warts and all, highlighting vicious practices in all its brutality and inhumanity. But where some would see this as gratuitous, they're missing the point of the liberated slave dispensing justice and vengeance where it is more than due. Django is not a cowering, obedient servant. As with The Dark Knight Rises stuck in the middle of a the Aurora mass shooting, here the Sandy Hook school massacre again brought up gun violence, and Tarantino was pulled into it, including a feisty UK interview where he got irate having to explain himself. The movie is violent and extremely bloody. But, that is why it has an age restriction – don't let your kids see it if they're too young, and if you're of a sensitive disposition, don't put yourself through it! And if someone watching a movie is nuts enough to have it trigger them to mass murder, anything can light their short fuse. The issue of the “N-word” was also rife, and I saw Tarantino in a red carpet interview with the France 24 news channel, pretending not to know what this N-word is unless they say it. The brave reported did, and the point of it is that that was how people were verbally degraded and it would be historically false to not include that language which was commonplace. For people who miss intense Westerns like The Wild Bunch, this will more than please you. PS. The homage name of Django is taken from the legendary Spaghetti Western hero portrayed by Franco Nero (who also gets a cameo in the film), but the director's cameo as an Australian didn't work so well unfortunately.